The Carnival of Homeschooling has lasted a quarter of a year. We made it to week 13! I have broken the posts into 13 categories. Some of these categories are related to the number 13. I was born on a Friday the 13th, and I’ve often challenge the claim that 13 is an unlucky number. In reading through the Wikipedia entry on 13 I was surprised to learn that in the Spanish speaking world it is Tuesday the 13th that is considered unlucky. LUCK: Some claim that the number 13 is unlucky. With It all begins with me Mental Multivitamin has some suggestions for homeschooling parents when things “break bad.” At Susie-Q&A, Susannah Cox has three catch-phrases that help her not to stress out. MISSING: Because 13 is considered unlucky, some tall buildings are “missing” the 13th floor. The floors are numbered from 1 to 12, and then 14 and up. Contentment Acres reminds us not to miss the precious moments that come with being a parent. Christine at Routon Family Homeschool writes about what may be missing between parents and children; moreover, she explains why parents should share their hopes and dreams with their children. FAMILY: One of the key strengths to homeschooling is how it builds family closeness. At Patricia Ann's Pollywog Creek Porch we read on how family relations were strengthen across generations. Leonie, of Living Without School, writes about how she was a “mean” mom to help her sons get through a tough spot. And Beverly Hernandez, of About Homeschool, continues a discussion about What are your families like? ADVICE for new Homeschoolers: At Key Words, Daniel starts a discussion about why it is best for parents to plan on homeschooling sooner rather than later. In Dad's Corner, Steve explains why so many parents are turning to homeschooling. Melissa Wiley at Here in the Bonny Glen debunks some common anti-homeschooling fallacies and shares her experience over the last ten years of being a homeschooler. FOOD: A baker’s dozen was 13 loaves, and now refers to 13 items, often food. Off the top reveals some mouth watering pictures from to a maple sugar house. ADVICE about families: FatcatPaulanne at Home*School*Home makes clear that while some families may look like they have it all together, they are just muddling through like the rest of us. Ann Voskamp, at ChoosingHome Blog, shares some ideas on how to Gently Tune-Up Your Dawdler. MONEY: I was surprised to find there are a whole lot of 13 items on a one dollar bill. At Home Sweet Home Melissa shares some of the important lessons her children learned from playing store. Heather at Duncan Learning Academy digs out web sites with FREE resources for homeschoolers. READING: Mrs. Happy Housewife explains how she taught reading using the McGuffey Readers. Homeschool Mami wonders if learning to read is taught, or caught. HISTORY: Children in the USA often start with history leading up to the original 13 colonies. Tami at Tami's Blog goes even farther back and shares their experience of seeing the Dead Sea Scrolls. Robert of Biblical Parenting found a great resource on a government website for learning more about history and government. ART: Trivium Pursuit has some tips on how to raise an artist. Nose in a Book explains how an appreciation for performance art can be developed. Linda Fay, who has been homeschooling from Turkey for the last ten years, at Higher Up and Further in has an easy to implement approach for teaching children about artists and their work. WORLD: I tried to get blog postings from 13 different countries, but I got to around eight countries and hit a stone wall. At HomeSchoolBuzz we learn that Koreans are starting to realize the benefits of homeschooling. Aaron, at Villiage Blog, in New Zealand shares some ideas on how to track down local homeschoolers. On Sydnor Update, Paul in Austria reports on the problems with getting the Austrian government to let him homeschool. ADVICE in general: The Thinking Mother says don’t spend too much time studying homeschooling curriculums and methods, just get moving. Sprittibee discusses ways that Christian homeschoolers can set realistic expectations and encourages us not to try and be perfect. MISCELLANEOUS: Kim at Relaxed Homeskool is bemused by the presence of bumper stickers at an annual homeschool conference. NerdMom, of the Nerd Family, recently found out that A Beka has been very supportive of homeschoolers who have suffered from national disasters. And finally my wife shares her thoughts about the dangers of a miseducation at college, and wonders about sending our daughters going off to college. One of the things I have enjoyed about the carnivals is meeting new homeschool bloggers. It is fun to see what others are trying, to see homeschoolers in the news, and to learn about homeschooling issues. If you have enjoyed this carnival, please spread the word. Please mention the carnival on your blog, and other appropriate places. There are other bloggers out there who haven't heard of the Carnival of Homeschooling. Go here for the archives of previous carnivals. 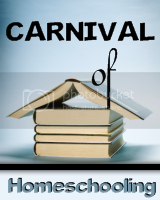 Next week the carnival will be held over one more week at Why Homeschool. If you are interested in submitting a post, click here for information. For those interested, the Carnival of Education will be coming out on Wednesday. This carnival is registered at TTLB's Uber Carnival. I'd like to thank everyone who has helped out. Thank you to all the participants in this carnival. And thanks to all those who have promoted the Carnival of Homeschooling. Another great carnival, Henry! Thanks for setting it up! Lucky 13 to you! Did you know that in our calendar the thirteenth of the month is more often a Friday than any other day?